Good Morning, Neighbor is a sweet, repetitive tale that explores how food can build community. Mouse wants to make an omelet and asks his neighbor, the blackbird, for an egg. The blackbird doesn’t have an egg, but does have flour, and suggests they make a cake. Thus embarks a tour of the neighborhood as the animals seek out an egg. By the time they find the bat with his egg and the owl with his oven eight animals have contributed ingredients and they start baking. The book is saved from being too predictable when the animals decide Mouse doesn’t deserve a slice of the finished cake, since he didn’t put in anything, and it’s hard to cut a cake into nine slices. Fortunately, the animals realize Mouse’s idea was the catalyst for the cake, and cutting nine slices isn’t so hard after all. 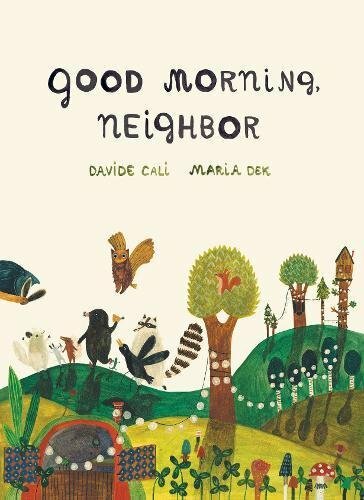 As is the case with many accumulating stories, reading Good Morning, Neighbor aloud can sometimes feel like a mouthful. However, the warm illustrations, reminiscent of Eric Carle and Jon Klassen, will capture the imaginations of young readers. The cumulative nature of the text would make this a useful book for math lessons in an elementary school classroom, and the theme lends itself to discussions about friendship and fairness. Parents might want to have baking ingredients ready, as this book is also likely to inspire young chefs to make a cake! Sara Leach is the author of seven books for children. Her most recent book is Slug Days, Finalist for a Foreword Indie Book Award for Juvenile Fiction.